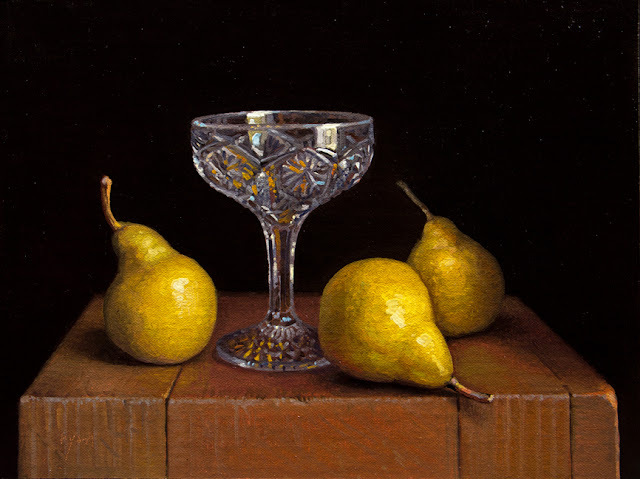 My 3-day July 24-26, 2019 workshop, Abbey Ryan: The Poetics of Painting, at Falmouth Art Center is open for registration. Space is limited and workshops fill quickly. Falmouth Art Center is a studio in coastal Cape Cod right across from the island of Martha's Vineyard. It's a gorgeous area. Register today to reserve your spot or Read more about the workshop here. If you have any questions about the workshop or Cape Cod, please contact Executive Director Laura Reckford at director@falmouthart.org or (508) 540-3304. If you're interested, I recently took an online course on intuition. As an artist, I found the topic to be so fascinating and useful -- learning more about how intuition works and where it comes from, how to tell the difference between intuition and emotion, how to trust your inner voice, and much more. I enjoyed thinking about how it all fit in with how I engage with my painting work and my interest in mindful studio practice. I also liked that the course format included audio recordings and live teleseminars that I could listen to while painting. Just thought I'd share because their next run of the intuition course begins today [here is the link to read about it]. 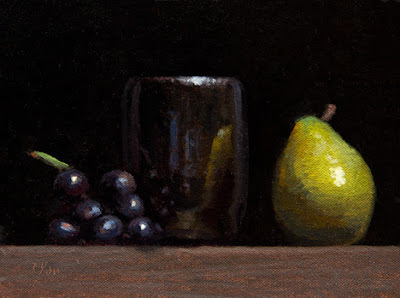 I've been focused lately on a very complex and large still life commission diptych, which I can try to share a bit about perhaps soon. 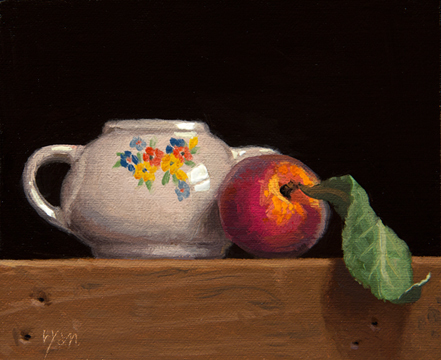 I have also been working on an updated version of my website, abbeyryan.com. I hope to launch that at the end of this month. Also, at the end of this month, the second installment of my exhibition the light | the shade will open at St. Bonaventure University in Olean, NY, which is the home of the Robert Lax Archives. More on that soon. "I loved the whole demo. Thank you. Your live demo was wonderful and so generous to us all. I will gladly watch it over and over because there's always something to learn. Knowing something of your technique -- painting with the one brush, controlling amount of paint, using paper to keep brush clean -- it was a great reminder of your what I call controlled painting freedom. Of course you're working with lots of past knowledge, but to see the image appear, so quickly, clearer and clearer, was exciting, really. I absolutely mean it that I will watch it again and again. What a gift to your followers." On Friday, Nov 2, I conducted a live painting demonstration in Grey Towers Castle at Arcadia University. The event was open to the public and streamed live in HD at arcadia.edu/livepaint. 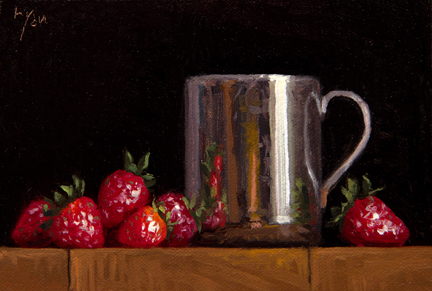 This painting (and my live demo) honors the memory of my friend, Jami. 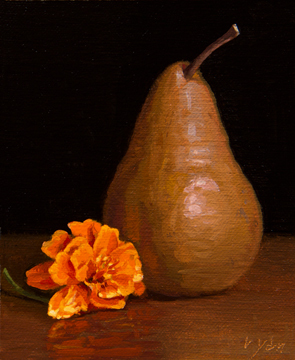 The painting is larger than my typical auction paintings and all proceeds from this auction will be donated to the Jami Rodriguez Memorial Scholarship at Arcadia. Read more. Also, if you look closely, there's one of my self portrait of sorts down the middle of the pitcher's reflections. $100 plus S&H to your location. Croker Poole is the winner of a free print. Please email me to find out how to get your new print! 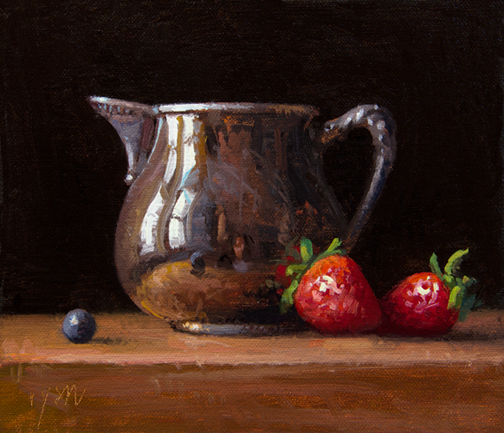 Watch my live painting demo here. I'll post more about it tomorrow, but in cased you missed it: On Friday, Nov 2 between 12-2pm EST, my daily painting was livestreamed at [arcadia.edu/livepaint] while I painted at Arcadia University's Grey Towers Castle. Tune in now to watch my live painting demo. Details about Q&A and free print giveaway below. This Friday, Nov 2, 12-2pm EST visit [arcadia.edu/livepaint] to watch my live painting demo in Arcadia University's Grey Towers Castle. 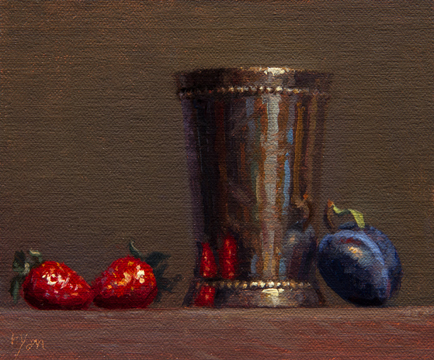 For 2 hours, I will complete my daily painting with the filming streamed live online for free. I've gotten this request over the years so we are going to try it this year. 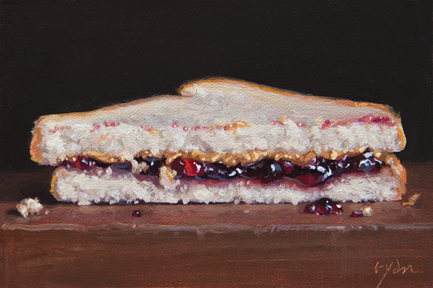 While I'm painting from 12-2pm, you can ask me questions via the the livestream page. Simply type questions in the Comments box below the video, my assistant will periodically ask me a few questions while I am painting, and will then respond back to you with my answers. 2) share the livestream by clicking on the Share "paper airplane" icon in the upper right corner of the video or the Share link below the video. 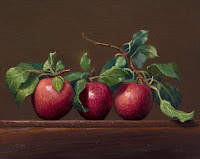 You’ll be automatically entered to win a free 8x10 signed Three Apples print. 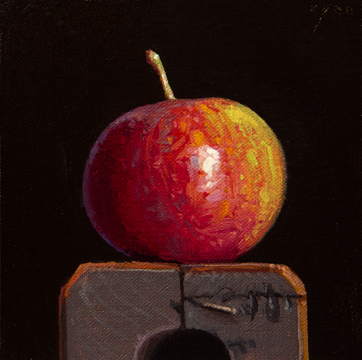 The winner will be announced Nov 5 when the Three Apples print is released. Since 2011, I've been doing an annual live painting demonstration as a fundraiser for Arcadia's Jami Rodriguez Memorial Scholarship. Jami was an artist and a good friend of mine. If you'd like to contribute a small donation on the occasion of my live demo, visit this donation page, select "Other" for designation, and type in "Jami Rodriguez Memorial Scholarship." To find out more about my live demos, sign up. 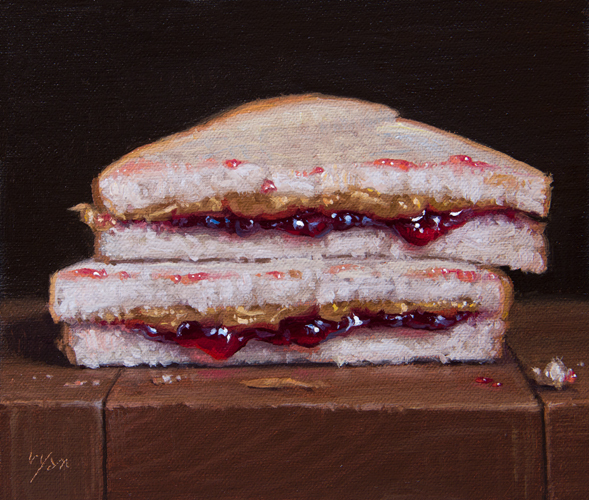 The last PB&J painting auction I posted was last November and before that was in 2015, I think. 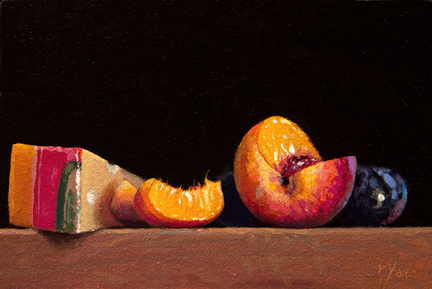 Likewise, it's been many years since I offered a new print of one of my paintings. My 8x10 painting, Still Life of Leaves with Three Apples, will soon be available as a SIGNED high quality 8x10 fine art limited edition print. The edition will be limited to eight (8) prints and will be released next Monday, November 5th at 12noon EST. If you want to have a chance to purchase the print first with the email coming in your inbox, sign up here. 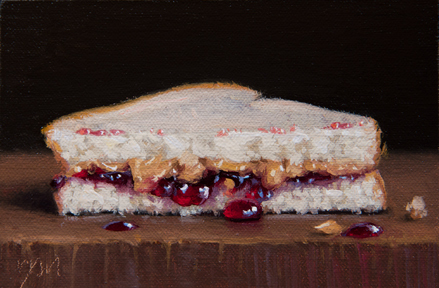 Just a reminder that my Live Painting Demo is THIS Friday, November 2 from 12-2PM EST. Details here. I will post all about it tomorrow. 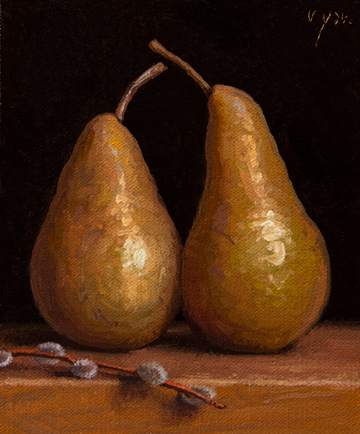 Bookmark this link [arcadia.edu/livepaint] if you want to tune in to my upcoming November 2nd live painting demonstration in Arcadia University's Grey Towers Castle. It's totally free to watch online or in person. I've been doing these live painting demonstrations as a fundraiser for Arcadia's Jami Rodriguez Memorial Scholarship since 2011. (Jami was a good friend of mine.) For 2 hours, I will complete my daily painting in front of a live audience, with the filming streamed live online in real time. Mark your calendar if you'd like to attend or tune in online while I'm painting live: [arcadia.edu/livepaint]. 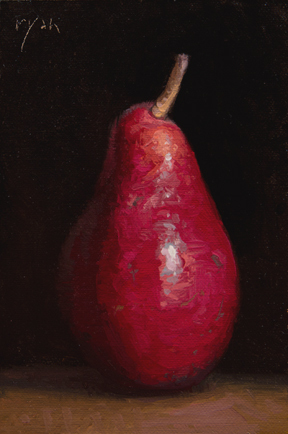 My upcoming live painting demo: Nov. 2, 12pm-2pm EST at Arcadia University. Watch online for free: streaming link is arcadia.edu/livepaint. If you'd like to find out more about this, feel free to sign up. I will soon be announcing the details of my upcoming November 2nd live painting demonstration in Arcadia University's Castle. I've been doing these live painting demonstrations as a fundraiser for Arcadia's Jami Rodriguez Memorial Scholarship since 2011. (Jami was a good friend of mine.) For 2 hours, I will complete my daily painting in front of a live audience, with the filming streamed live online in real time. Mark your calendar if you'd like to attend or tune in online while I'm painting live. My upcoming live painting demo: NOV 2, 12pm-2pm EST at Arcadia University, Glenside, PA. Streaming link will be posted soon. If you'd like to find out more about this, feel free to sign up. "Albert Camus memorably admonished that those who prefer their principles over their happiness remain unhappy, suggesting that such rigid personal dogmas at the expense of actionable happiness are a form of especially dehumanizing self-punishment. Nearly a century earlier, Vincent van Gogh (March 30, 1853–July 29, 1890) explored this disconnect with great wisdom in a letter to his brother Theo, found in the 800-page treasure trove Ever Yours: The Essential Letters." 'Don’t think that I look with contempt on people such as you describe because their life isn’t founded on serious and well-considered principles. My view on this is as follows: the result must be an action, not an abstract idea. I think principles are good and worth the effort only when they develop into deeds, and I think it’s good to reflect and to try to be conscientious, because that makes a person’s will to work more resolute and turns the various actions into a whole. I think that people such as you describe would get more steadiness if they went about what they do more rationally, but otherwise I much prefer them to people who make a great show of their principles without making the slightest effort to put them into practice or even giving that a thought. For the latter have no use for the finest of principles, and the former are precisely the people who, if they ever get round to living with willpower and reflection, will do something great. For the great doesn’t happen through impulse alone, and is a succession of little things that are brought together.'" Read more. 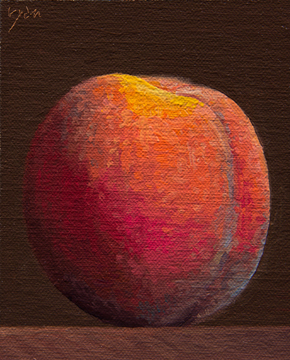 If you enjoy this painting, you may also like to see some of my other paintings of peaches. 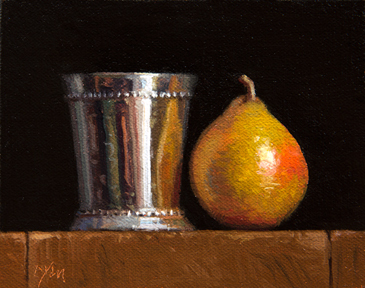 If you enjoy this painting, you may also like to see a bunch of my paintings from my Golden Series. "The donor behind the prize wanted to remain unknown. But now she is stepping out from behind the curtain: Susan Unterberg, herself a once underrecognized female artist over 40. In a recent interview at her Upper East Side home, she said she has decided to come forward so that she can more openly argue on behalf of women who are artists, demonstrate the importance of women supporting women and try to inspire other philanthropists." Keep reading. 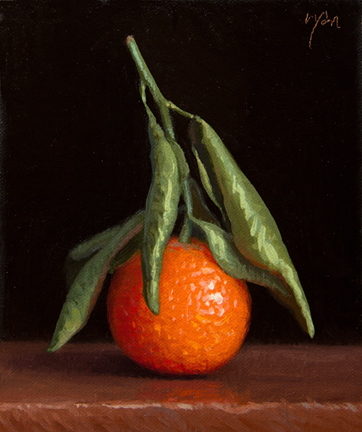 Last month, I was a visiting artist at the renowned Academy of Realist Art in Boston. 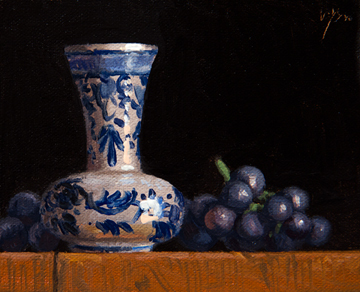 This painting is another one of my demo paintings from the three-day seminar. The group of painters who attended the seminar was just awesome. To learn more about my teaching, sign up here. 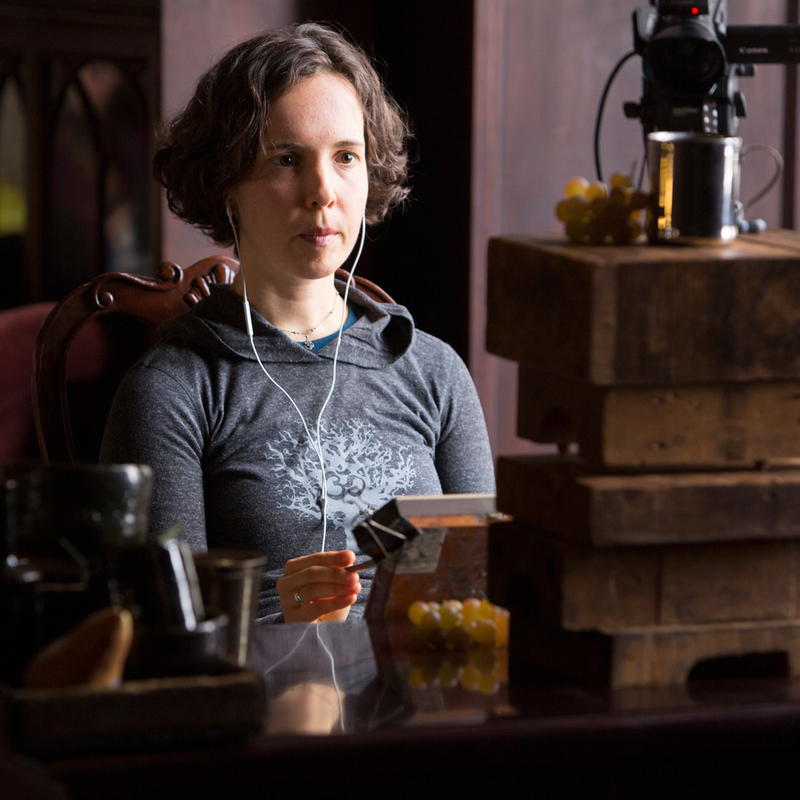 "Going into this workshop a bit anxious and reserved, I appreciated the calm, meditative, and supportive atmosphere Abbey created in the studio. I appreciated the thoughtful and specific feedback I received from Abbey. I noticed that as peers asked her questions either about her own work or theirs, she was often quiet for an extended period of time as she carefully thought through her explanation before answering. I remember thinking how Abbey's silence was just another extension of her approach to painting; her answers were always mindful and clear. 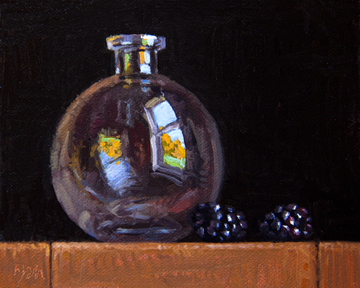 I loved being able to watch Abbey work from start to finish on a still life painting. I gained so much knowledge from simply observing her, and found myself making connections about her process and technique from one day/painting to the next. 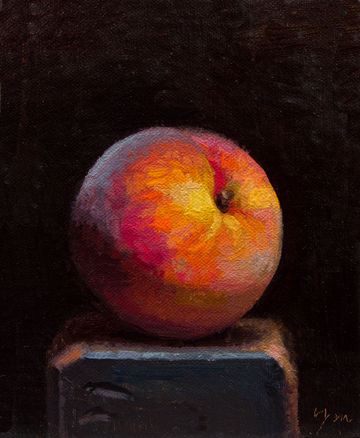 oil on linen on panel, 2018, 6"x5"
"Ryan excels at portraying reality so perfectly that it seems beyond perfect, hyper-beautiful. 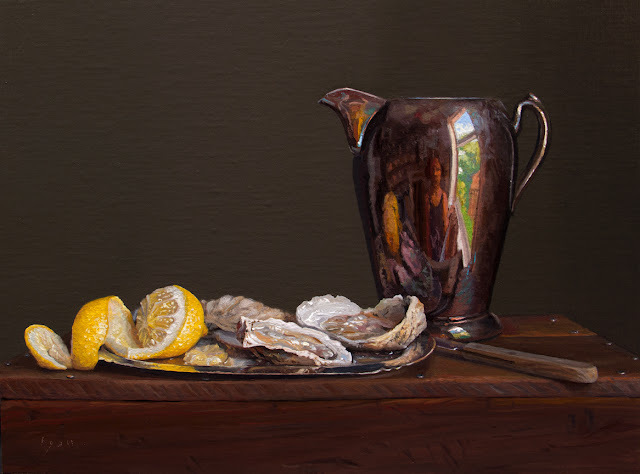 Additionally, her use of dark backgrounds behind her subjects and dark wooden frames for her paintings serves to focus the viewer’s attention on her stunningly constructed subject matter." Continue reading. You can always adjust your preferred email list by clicking on the "Update Profile" link at the bottom of every email I send. As always, your email will never be shared with anyone.